The Public Works Department Sidewalk Program is responsible for installing miles of sidewalks in Austin for transportation and recreational use. The Americans with Disabilities Act is a driving factor in making sure that the right-of-way along Austin's streets are safe and accessible for all. View the 2015 Peer Cities Report: A preliminary step to the 2016 Master Plan Update. 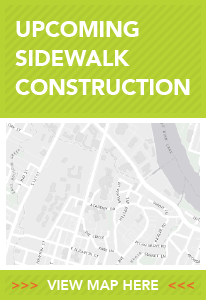 View an interactive map of sidewalk projects scheduled to begin within the next 30, 90 and 180 days. Sidewalk Program funding from 2016 bond, Quarter-Cent funds, fee-in-lieu, grants, and other sources. View a map of the absent sidewalk network in Austin (with scoring results from very high to very low priority). Updated Nov. 2017. View a map of the existing sidewalk network in Austin (with scoring results from very high to very low priority). Updated Nov. 2017. 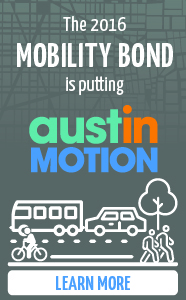 Want to learn more about Austin's sidewalks? Let's take a walk: A look at Sidewalks in Austin. View a helpful handout that breaks down the history of sidewalks in Austin, the state of the sidewalks, how sidewalks are funded and built, benefits and how you can get involved to make a difference. There are many ways to get involved. Work with your council elected mayor and council members. Be informed on local elections. Join and engage in local government at City Hall by serving on a board or commission that is important to you.